According to the book and its charts, the authors accumulated over $900,000 (on a relatively modest combined income of less than $100,000 per year for most of their investing years), retired early at age 43, and began traveling the world. You can see where they've been at Where We Be and learn about their investing, frugal living, and retirement journeys. I'd like to say that I have plotted and achieved my life and financial goals as clearly as this couple has. But I haven't. Though I enjoy creating spreadsheets, I haven't maintained and updated them diligently — particularly when parts of my life didn't proceed according to plan. Books like this one — including an accounting of how the couple's portfolio dipped (temporarily) about $200,000 from its high during the Great Recession — affirm that many of my experiences are similar to others. Accumulating wealth can be much simpler than managing wealth — as long as you have the money to invest in not-so-good times (when prices are low). In contrast, preserving wealth while living off accumulated assets can be the bigger challenge. It's particularly daunting when the market is flat or in significant decline (thus, my personal decision to hold more cash). What made the Great Recession so difficult wasn't necessarily that the markets were down. The problem was that so many were unemployed and therefore had to draw down their assets in order to pay their bills — instead of being able to put “new money” into investments at bargain prices. If you save when you're young, you can take greater advantage of compound interest. The earlier you start investing, the earlier you may be able to benefit from the exponential power of compound interest. I illustrated how compound interest works in an article on Compound Interest with Examples and Explanations. Charlton gives a great example of how compound interest can work to your advantage. He says that when the S&P 500 gained 16% in 2006, compared to 29% in 2003, their net worth associated with investments grew more in 2006 than 2003. The reason: their accumulated balance grew more in terms of absolute dollars because of a greater capital base. For example, if I have $200,000 and realize an investment return of 29%, I'll gain $58,000. If I have $400,000 with an investment return of 16%, then I'll gain $64,000. The larger the base, the more impact the returns make. Buying the less expensive house frees cash for investing. Sure, there are reasonable situations in which you might stretch your budget to afford a more expensive home. But the expected growth in income or reductions in expenses needed to pay the mortgage and still have money left over to invest may never come. As a result, you may get stuck with a house you can't afford. There are compelling reasons for many people, especially average earners, to buy a more affordable house. If you spend just 20% of your gross monthly income on housing as suggested by the Charltons (rather than the 28% you may be able to borrow), then you may be more likely (all things equal) to have money available to invest. Employer's company stock programs can boost retirement savings. Charlton says that company stock was one of the couple's best investments. He bought company stock through a program at his employer, which matched 20% of his purchases up to certain monthly dollar limits. Based on my readings, financial experts often don't favor company stock in investment portfolios. They recommend limiting company stock to 5% to 15% of a portfolio. The rationale is that if the company experiences problems, not only will your net worth decline but you may lose your source of regular income, health benefits, etc. at the same time. Further, just because your company matches your purchases doesn't automatically mean this part of your portfolio will consistently experience growth equal to the amount of the match. The stock price could fall soon after your buys. On the other hand, a gain of 20% (or more, if the stock price continues to rises) greatly benefits portfolio growth. A portfolio of index funds can be a simple approach to investing. Charlton invests largely in low-cost index funds with Vanguard. I've written about creating a Vanguard portfolio and why actively managed funds have historically under-performed passively managed funds (index funds). When I started investing, index funds were still relatively new (less than 10 years old). So, my path to wealth building was not centered on index fund investing. Still, I like the idea of developing a portfolio of index funds as a simple, hands-off way of investing. Health care can be expensive (and an early-retirement deal-breaker). I especially liked Charlton's discussion about health care. Like him, I realize that I could suffer a medical disaster (through an accident or serious illness) that could destroy our savings. I'm reasonably knowledgeable about health care insurance and my article on Choosing Health Insurance is fairly popular. I've scrutinized and bought insurance on the open market, through COBRA, and employee benefit programs. However, I haven't purchased insurance through the health insurance exchanges associated with the Affordable Care Act (ACA) and don't know the ins and outs of this system. The book covers medical insurance before and after the ACA as well as medical tourism for common coverage gaps like dental and vision benefits. Charlton discusses subsidies and how they can substantially reduce premium costs. 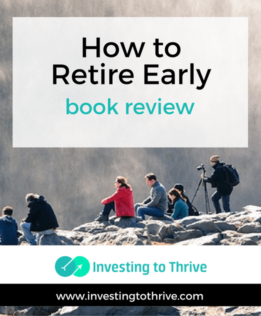 After reading How to Retire Early, I have a much better grasp of how to qualify for lower costs. There's a lot more in the book than I've mentioned here. For example, Charlton shares important advice on investing in yourself in order to grow personal earnings. This investment in your personal earning capacity can deliver great returns. Plus, it may allow you to generate extra cash from your paycheck to start and add to your investments. If you're looking for an easy-to-read book that covers the basics of finances prior to and following retirement, you'll enjoy and benefit from How To Retire Early: Your Guide to Getting Rich Slowly and Retiring on Less.